The Orchard Green Resort and Spa is located amidst the lush green Deodar Forests offering a grand view of the apple orchards, fields, cottages, villages and surrounding valleys. Each room provides a maximum view of the natural surroundings and maintains a moderate temperature. 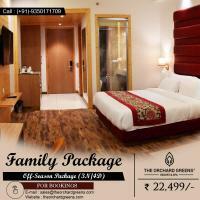 This best luxury resort in Manali assures you a great holiday and family time.